I love taking pictures of holos far too much to pare down on how many I share, but thought a post with 50 pictures might be a little too much, haha. So I am splitting this collection into four posts with three polishes each -- mostly divided into cooler vs. warmer shades. OMG a UFO is a mossy olive green. This was the first one I swatched so I did have to do a bit of dabbing on bald spots -- however an even two coats is definitely full coverage for all these polishes. I didn't know how I would feel about this color but I ended up liking it! Of course that shouldn't really surprise me with my current love affair with green polish, haha. Sci-Fly By is a pretty bright sky blue. 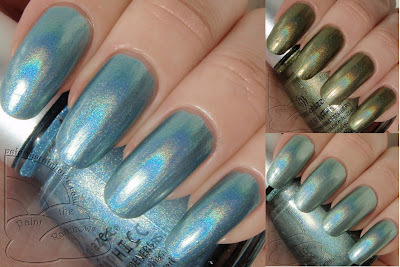 It is a pretty typical light blue shade for holo collections, but it is really pretty! A cornflower shade, kind of. It seemed kind of excessively frosty compared to some of the others -- especially in the shade. Frosty isn't my thing, but I still like this one. And last for today, Don't Be a Luna-tic is a light aqua. It almost seems seafoam-y to me. I really like this shade, it took a bit for it to grow on me, but I think it is really delicate and pretty. I don't exactly have an extensive holo collection, but I am pretty sure this is a unique holo shade for my stash. Aren't they lovely? :) I have heard grumblings amongst others that they were not as holo as expected, so I was set up to be disappointed, but they were actually quite nice in my opinion. The linear effect is super smooth and totally gorgeous -- rather than visible chunky bits of holo, it is like they have a rainbow glow - amazing! Very pretty! Can't wait to see the rest! Your swatches make them look a lot more holographic than some of the others I've seen. I think that may be because some people only take flash pictures instead of sun. The outside photos are pretty accurate in how the holo shows up -- these definitely look their best in direct sunlight.